Congratulations to The Copthill Choir. 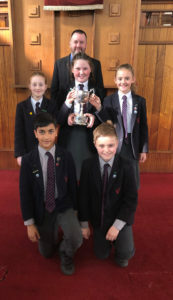 The choir returned home victorious from the Lincoln Music and Drama Festival. The choir competed over two days in the Junior category and were awarded first place in the final adjudication, a fantastic achievement. Mrs McAlindon is simply beaming with pride, well done everyone!